We hope you enjoy reading about the key milestone phases and highlights of The Ghosts In Our Machine. 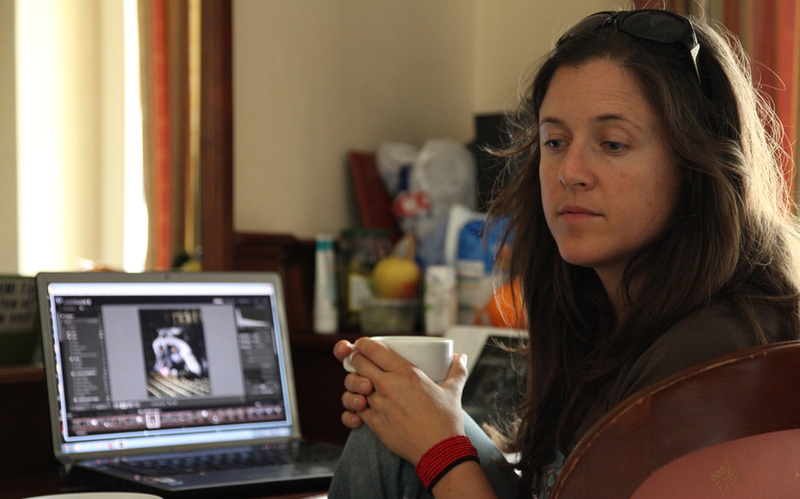 Filmmaker Liz Marshall was conceiving of a cross-platform and feature length documentary since 2004 about the use and abuse of animals, inspired by her partner Lorena Elke’s longtime commitment to animal rights. Liz was determined to create a beautiful and accessible project about this marginalized and harrowing subject. 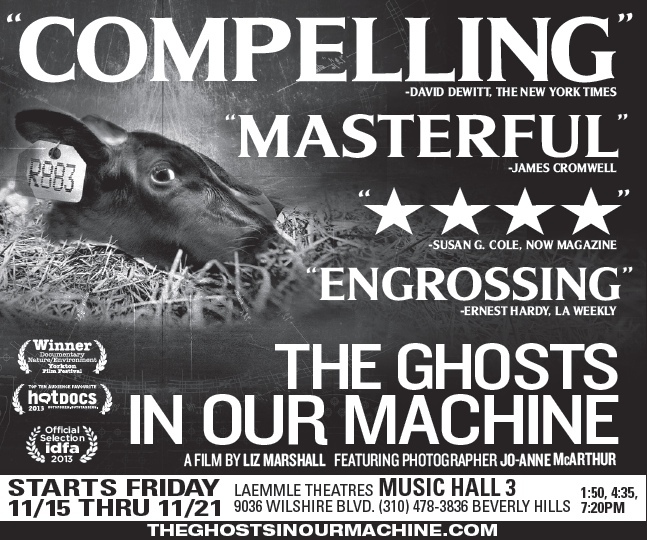 The Ghosts in Our Machine crystallized in 2010, during which Liz engaged in many discussions with animal rights photojournalist Jo-Anne McArthur (Jo) about her body of work We Animals. Liz invited Jo to be featured as the project’s main human subject. Read Director’s Statement. The Research and Development phase of any documentary is critically important. It’s a fully immersive process whereby a vision is formally developed, and a funding pitch package is created. Phase 1 lasted from October 2010 to May 2011, produced by LizMars Productions, the Toronto based company representing director, writer, producer Liz Marshall. Support and funding partners were the DocShift Initiative, the Culture and Animals Foundation, and 113 donors through a crowd-funded campaign on Indiegogo. The following materials were developed: Synopsis; the first two official trailers; a web segment called “Maggie’s Story”; an initial branding kit; Look Book, and a flash-based prototype website representing the first iteration of the project’s active and engaged website, including 16 featured endorsements by prominent international Animal Ambassadors. During the 2011 Hot Docs Documentary Film Festival, Liz pitched Bruce Cowley, Commissioning Editor of Canada’s documentary channel, and a few days later he gave the greenlight for Phase 2 Development of The Ghosts In Our Machine – a Cross-Platform documentary. The Phase 1 Development team included photographer and protagonist Jo-Anne McArthur, producers Avi Federgreen and Nina Beveridge, cinematographer and editor Karol Orzechowski, researcher Lorena Elke, brand designer Sarka Kalusova, and website technical and administrative support Michael Tucker. Subsequently, Webby award-winning artists The Goggles were inspired by the initial concepts and offered their talent as designers and interactive directors, to develop an online interactive companion to the film. Canada’s Bell New Media funded the Development of the the digital Cross-Platform arm of the project. For Phase 2, Liz Marshall and Nina Beveridge (LizMars Productions. and H.I.V.E Productions.) became official co-producers of The Ghosts In Our Machine and established the single purpose production company Ghosts Media. The primary purpose of Phase 2 Development for the film was to flesh out the concept by doing some more shooting and writing, and to create a new and extended trailer to convince Bruce Cowley of documentary channel to fund a feature length production of The Ghosts In Our Machine. Liz directed the trailer through the heart and photographic lens of Jo-Anne McArthur during a rescue mission by Farm Sanctuary in upstate New York. 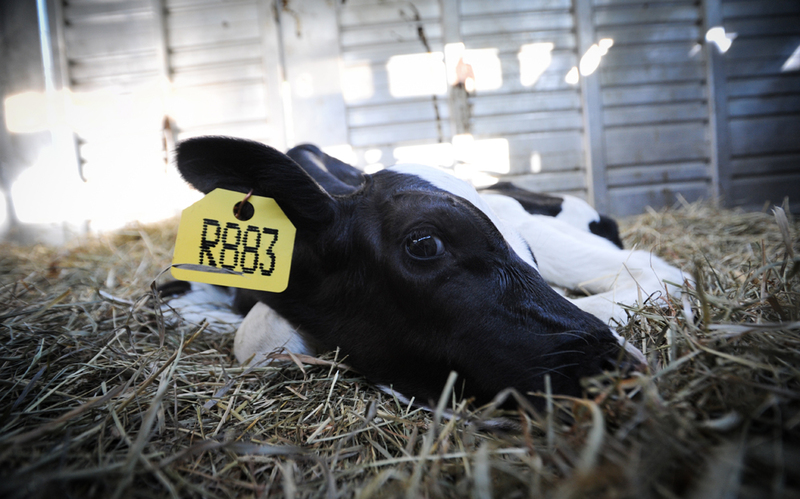 Jo photographed the rescue of two sick and “spent” cows from a dairy auction during an expert mission led by Susie Coston, the National Shelter Director of Farm Sanctuary. The dramatic and heart warming stories of Fanny and Sonny are featured in the extended trailer and are two of the featured animal stories in the final film. Read about them here. The trailer also touched on Jo’s professional trajectory with her New York based agent Redux Pictures, to have her photography published and seen by a larger audience. The Production to post-production phase spanned January 2012 – February 2013. The project was fully financed, the feature length documentary was shot, edited, mixed and packaged, and a robust magazine themed website was launched! An epic workload for Ghosts Media. Other core production funders included the POV strand of the Canada Media Fund, and the Shaw Media-Hot Docs Fund. See full list of supporters and funders. 180 hours of footage was shot in parts of the USA, Canada and Europe, and hundreds of photographs were taken. The production team accompanying Liz in the field, and usually Jo, included cinematographers John Price, Iris Ng, Nick de Pencier and sound recordist Jason Milligan. 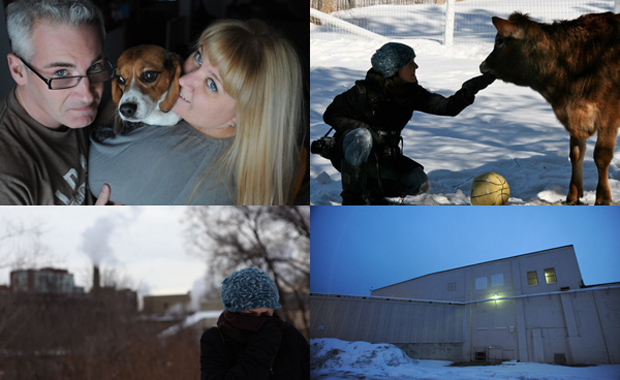 Locations included an undercover fur investigation in parts of Europe, and visiting Farm Sanctuary three times in upstate New York. Picture editing lasted 6-months, beginning in June 2012 and ending in December 2012 with editors Roland Schlimme and Roderick Deogrades. Music composition, sound editing and the sound mix spanned Phase 1 Development to February 2013, with composer Bob Wiseman and post sound team Garrett Kerr and Daniel Pellerin. Another highlight was getting “artist approval” from Radiohead for the use of their hauntingly beautiful song “Give Up The Ghost” during the end credits of the film. Read about the song here. 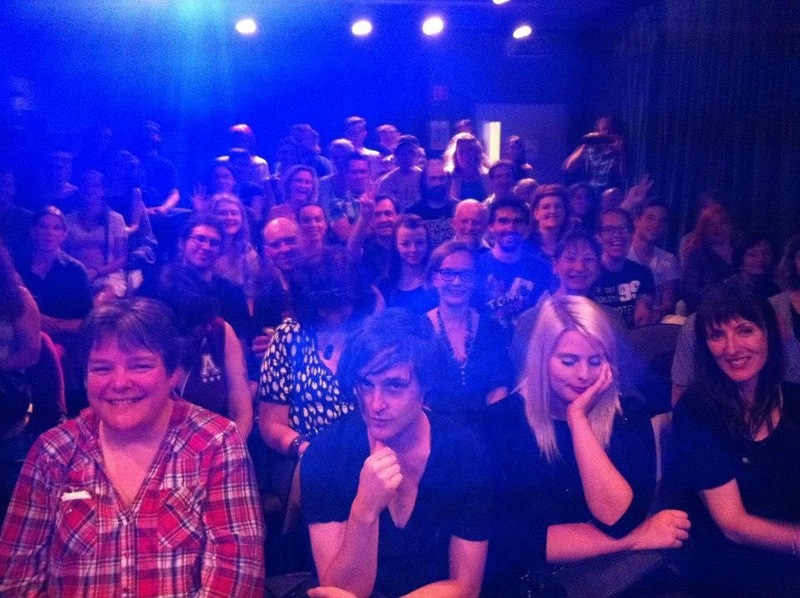 Read Liz’s Director’s Blog “The Look & Feel of Ghosts: The Making of The Ghosts In Our Machine“. It is a conversation with the creative team about some of the many decisions that went into the epic journey of actualizing the film’s vision. For the interactive addition and the creation of a magazine-themed website, Ghosts Media was greenlit for production by the Bell New Media Fund and Liz and Nina partnered with interactive directors The Goggles (Paul Shoebridge and Michael Simons) and interactive producer Fulscrn (Sean Embury) to create a flash-based immersive narrative companion to the film. It is a clickable full screen experience accessible for free from the film’s website, and was created in tandem with the film’s post-production schedule, and released in tandem with the film. Meet the entire film and website Team and read their bios. From an audience building and engagement perspective, Liz launched the project’s Facebook page during Phase 1 Development with the intention of unfolding the journey in the public eye. It has been (and continues to be) an active and interactive vibrant hub. Jo-Anne McArthur’s We Animals FB page is very active and popular. Both Jo and Liz prioritized the muscle of social media to leverage The Ghosts In Our Machine, and to engage directly with audiences. Facebook has served an enormous function — establishing and mobilizing a global following for the documentary. Other forms of outreach and online activity existed from the film’s website between 2012 – 2014 including a monthly Animal Ambassador program, a gentle advocacy initiative called The Ghost-Free Journey led by co-mentors Rosemary & Donna and supported by the LUSH Charity Pot. There were 36 editions of a monthly digest e-newsletter called Friends of the Ghosts, check out the archive. The Ghosts In Our Machine enjoyed a successful World Premiere on April 28th, 2013 at the 20th anniversary of Hot Docs, North America’s largest documentary film festival. The film was voted a Top Ten Audience Favourite and was featured on the front cover of POV, Canada’s premiere documentary magazine. What followed was an all consuming 1.5 year global outreach and engagement campaign, attracting and expanding and fuelled by a passionate core audience around the world. In 2013, Ghosts Media supported the Canadian release (11 cities and 5 consecutive weeks in Toronto) by distributor IndieCan (Avi Federgreen) before producing and self-distributing a US Oscar qualifying theatrical release campaign in 4 major US cities. As a result, the film was reviewed by most major outlets in North America. 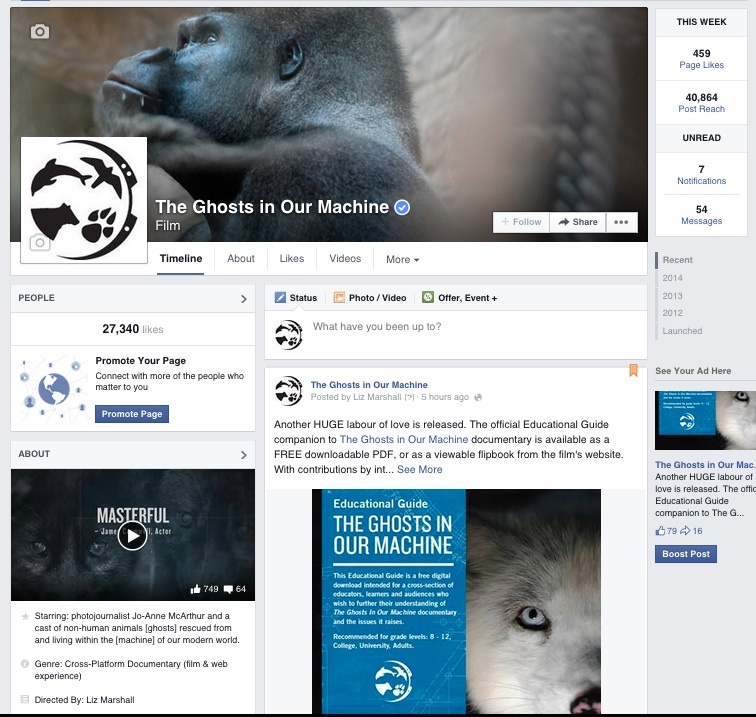 The Ghosts Media campaign was funded through various stakeholders: the Animal Welfare Trust; the VegFund; hundreds of Indiegogo donors, and supported through Women Make Movies. Read all about the campaign and the incredible groundswell of support by the animal advocacy community. In addition, the film had its prominent European launch at the world’s largest documentary festival the International Documentary Festival of Amsterdam (IDFA), and was voted a Top Twenty Audience Favourite (#13). Between 2013 – 2014 the film premiered at over 25 global film festivals. On Earth Day in April 2014, the film was released on DVD. Paper inserts for the recycled resin DVD cases were generously donated by Woody Harrelson’s tree-free paper company Step Forward Paper. 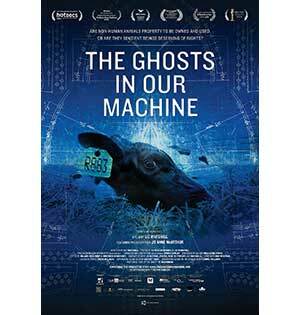 The Ghosts In Our Machine has swept up a number of awards and nominations, see list here. The film has been endorsed by celebrities, public figures, notable filmmakers and leaders within the animal advocacy community, see Kudos page. Read the many diverse reviews and interviews. All of this and more raised the profile of the film, helping to put the issues of animal use, abuse and animal sentience on the public agenda. From February – December 2014, LizMars Productions produced an international Community Screenings and impact campaign, and distributed 92 unique events around the world, working with diverse international hosts and partner organizations in 71 cities, spanning 5 continents. This included the release of the film as part of a tour in the United Kingdom and in Ireland, which generated mainstream press, including a 06:00 minute live primetime interview on BBC World News. Watch it here. The campaign was funded by Europe’s the Bertha BRITDOC Connect Fund. Read about it. And, a 52-page full colour official Educational Guide was produced, with contributions by international lawyers, academics, educators, activists, scientists. It can be downloaded for free here. The final phase of the campaign was an Impact Evaluation, to gauge how the film is affecting changes in attitudes and behaviour. 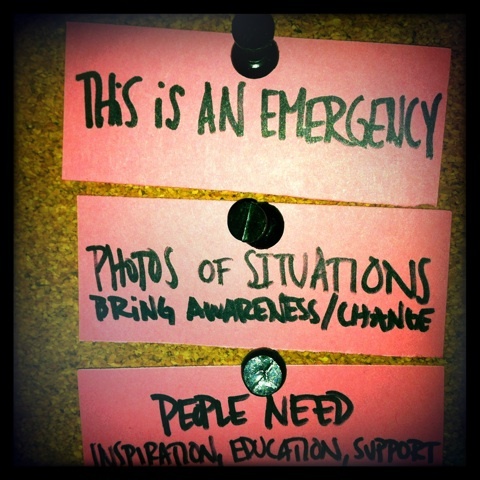 Between December 2014 and January 2015, LizMars Productions conducted a formal impact evaluation in partnership with the US-based nonprofit organization, the Humane Research Council, funded by the Bertha BRITDOC Connect Fund. It marked the final phase of the film’s global 18-month outreach and engagement campaign. The Ghosts in Our Machine was made available for free for a 3-day period, and the response was overwhelmingly positive: more than 4,500 people from more than 90 different countries (on 6 continents) viewed the film in just 72 hours! The final step was to survey the viewers to understand how the film influenced them. The Ghosts in Our Machine is making a difference for animals, as demonstrated by results from the large-scale follow-up impact evaluation. Download Impact Report. Study it, share it. Ghosts Media has several international distribution partners, from educational to digital to broadcast to non-theatrical. See list of distributors. Watch The Ghosts In Our Machine around the world in English, French, German, Portuguese and Spanish. Thanks for reading! Thank you for your interest.